Snail and other bizarre animal invasions! 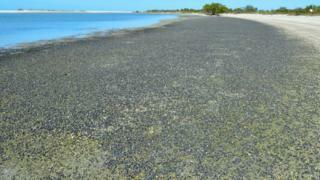 Millions and millions of snails have invaded Fort De Soto Beach in Florida, USA. The tiny snails are only a few centimetres long each - but together they have been able to cover a long stretch of this sandy shore. No one is exactly sure why they have arrived on this beach, but some believe they have left the water to find food that has been washed up by the recent hurricanes. These are black cerith snails, and they usually hide in reefs where the ocean water is warm. Cerith snails are often found in saltwater aquariums. They like to eat algae and waste material which helps keep the aquarium clean! Seeing this snail invasion got the team at Newsround thinking about other amazing animal invasions we've seen over the years. Take a look at our collection below. Snails aren't the only sea creatures that like to venture out of the water. These crabs in Cuba come out each spring and travel for days from forests down to the sea. Once the crabs reach the sea, they lay lots of eggs in the waves. The baby crabs hatch out at sea, then come and join their parents in the forest. In 2015, hundreds of manatees gathered in Three Sisters Springs in Florida, USA. The springs, a local beauty spot, were forced to close to the public while the manatees were swimming in the shallow waters. During colder times of the year, manatees will often go in search of places with warmer water, but it is unusual to find this many in one place. Thousands of locusts caused chaos in 2013 when they followed warm winds from Egypt to southern Israel and Gaza. Locusts can cause lots of damage in the places they travel to. They tend to travel in large numbers and eat farmers' crops. However, some locals saw the positive side to the situation. They have decided to eat the locusts as a tasty snack!